It’s recommended that you use the original Japanese power adaptor that came with the Famicom, Disk System or accessories when playing in the United States or Canada. To do so will require a step-down converter. The Japanese Famicom power adaptor is equipped with the same prongs, and nearly the same input voltage (AC 100V) as AC adaptors used in the United States and Canada. The proper output voltage is DC 10V, 850mA. Never use an NES AC adaptor with your Famicom. Most adaptors transform the electricity from AC to DC. The NES adaptor takes the input voltage down but still puts out AC, which is potentially harmful to your Famicom. To prevent from overheating and damaging your Famicom, it’s highly recommended that you use a step-down converter. Japanese electrical outlets output 100V, which is what the Famicom power adaptor is made to input. United States and Canadian electrical outlets output 120V. 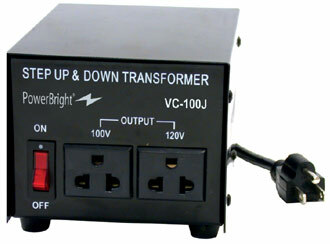 Step-down converters that will convert the electrical outlet output to 100V are available online and in stores.